Ok, workshop time. It started around 4PM, and that’s when we met Teacher Try. He’s one of the owners of the cafe, and he has been a musician for more than 20 years now. I kid you not: just meeting him and listening to him talk about music left all of us inspired— his heart was bursting with his passion for the art. He says that the ukulele is an underrated instrument, but he believes that it has so much beauty and potential. 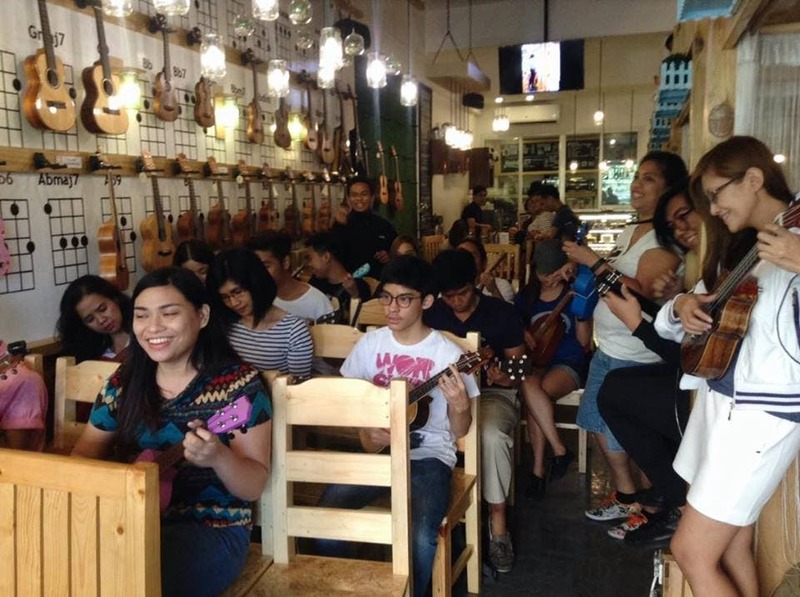 Because of this, he holds ukulele workshops for free at Uke Box Caffe, so that he can build a community of passionate ukulele players in the city. Teacher Try is such an inspiring mentor, hands down. He has so much faith in his students, and has so much enthusiasm and energy in him. From the clueless person I was, I could definitely say that Teacher Try and Uke Box Caffe have turned me into a uke enthusiast!!! The workshop started with a brief intro of the uke. You know—its history (it was created in the 19th century), its origination (it was a hi-brid instrument created by Hawaiians), its different kinds and sizes (soprano, concert, tenor, and baritone), the pronunciation of the word ukulele (lol), yaddayaddayadda. And then we got introduced to Teacher Try’s little baby: a teeny, tiny uke— the smallest one in the Philippines, in fact. He says that there are only two pieces of the size here in the country. AWESOME. Before we learned to play some songs, we did a quick warm-up. Who knew we had to do stretching exercises for our hands and fingers before playing the strings? In the whole 3 hours that we were together, we learned seven (!!) songs. Even though most of us were beginners, Teacher Try and his friends believed in us and pushed us to our limits! :) We were given an intro on scaling, too, which was pretty neat. Everyone was kind to and supportive of each other. We’d help each other in learning chords and strumming patterns and whatnot. Ah, the spirit of family! At the end of the workshop, we were divided into three groups to practice all of the seven songs that we learned. And then, we performed em on stage! Check out this one-minute video of the day’s highlights! I am so glad we decided to attend this class. Proud to say, a flame’s just been ignited and we’re all so eager to learn the uke more! UKULELE FEVER YASSS! You can enroll in Uke Box Caffe’s FREE Sunday Ukulele Workshops, too. All you have to do is message them over at Facebook with your name and contact number for reservations. They are located at 187 Village Center Euloguio Rodriguez Jr. Ave Brgy. Bagumbayan LIBIS, Quezon City (just outside Eastwood City). 1) Make a uke cover of your choice, either solo or duo (you must use at least one ukulele). 3) Share it! The more likes; the more chances of winning. 4) Submission of entries starts today and the winners will be announced on Uke Box Caffe’s 1st year anniversary on May 30, 2016. Cosplay Mania ’12 – Five years of providing world-class cosplay events!